January 20, 2019 0 comments on "Best Small Air Fryer Reviews 2019"
We can’t let limited kitchen space stop us from eating healthy. Unlike deep fat fryers, air fryers are a lot healthier way of frying different foods. They allow you to fry your food without the need of soaking it in oils. Simply put, you are deep frying without the oil, without the fear that you might clog your arteries with all the fatty oils. please keep on reading below. This sturdy little air fryer will leave you with plenty of kitchen counter space and only needs a little overhead clearance compared to most comparable models. But don’t worry, its capacity and performance were not compromised. To begin with, its frying basket has a total size of two liters, that is large enough to accommodate as much as eight chicken wings or up to one pound of french fries. There’s also a basket separator that lets you cook two different kinds of food at the same time without mixing their flavors. This air fryer also cooks fast and I mean really fast. For example, one serving of chicken nuggets can be quickly cooked in as little as 10 minutes (this is half the time of regular cooking). Isn’t this just perfect for every working person who find themselves always in a hurry? What is more, you will absolutely love all the hot food coming out from this fryer, the chicken will be crunchy as you want it to be, plus they will be evenly cooked. Even the jalapeno poppers were impressively mushy while the catfish is just juicy and flaky. And since it uses high power convection structure for its fan, the pre-heated air will surround the food so you will need little to almost no oil at all. As a result, you will get ready for a guilt-free chow. This air fryer has a 60-minute timer that allows you to properly cook wide-range of food varieties; this is twice as long as similar models. If you’ll switch ON the timer, the air fryer will turn off automatically to avoid the danger of overcooking your food. It also features adjustable control of the temperature which you can set within the range of 175 to 400 degrees Fahrenheit and that will regulate according to what your recipe is. one will turn off when the preheat temperature is reached. It is also very easy to clean since the air fryer’s separator and basket come with a non-stick coating and even dishwasher-safe. The pan under the basket also uses a nonstick coating, though it is not safe for the dishwasher. your kitchen with its clean and a minimalist black and silver finish. The thin, cylindrical design of this compact air fryer from DASH has a really small space requirement. But the most highlighted part of its features is the air crisp technology as well as its rapid air circulation system that will not only make your ingredients crispy as quickly as you want it to be but at the same time eliminates the extra calories you get from added oil. Yes, you heard it right folks! 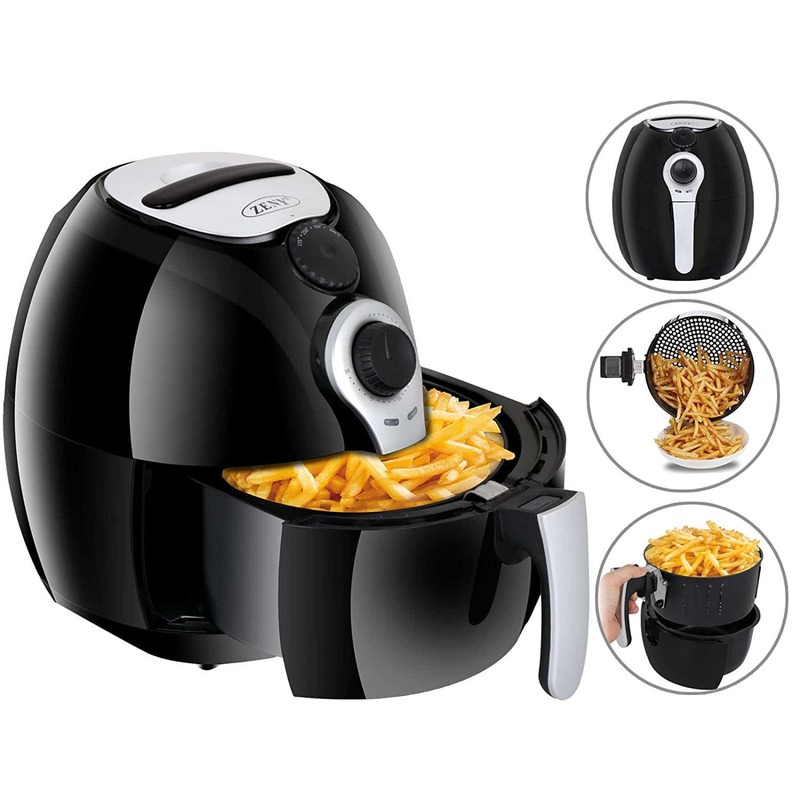 You will use 80% less oil with this air fryer. This means you will get to enjoy delicious food with lesser calories. But of course, the good news doesn’t end here! 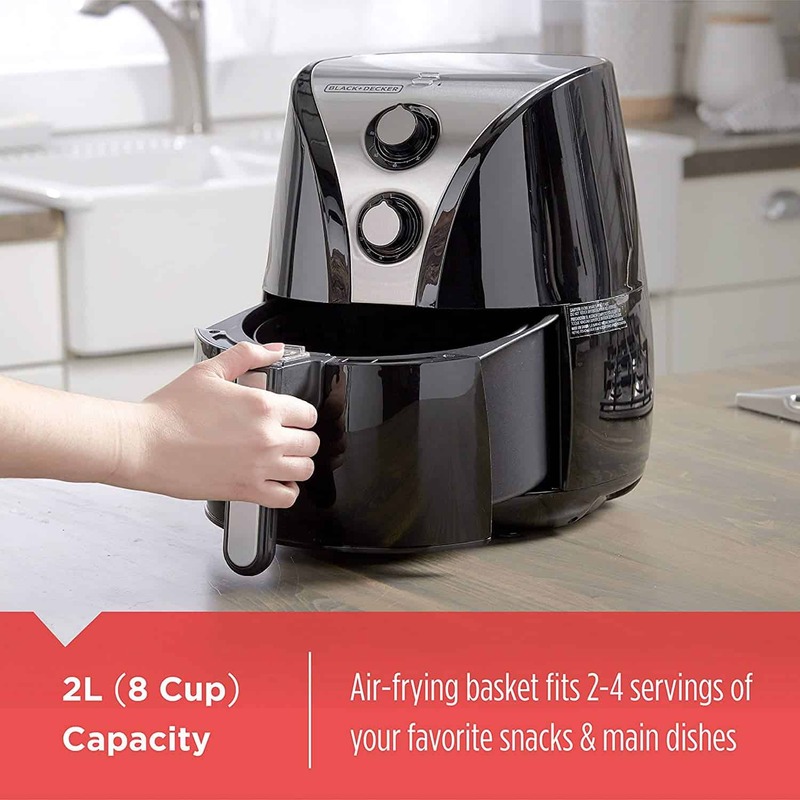 Though it has been popular for its space-saving character, this air fryer has a 1.2-liter basket capacity that is enough to fit two small chicken breasts or enough fries you can share with your partner. 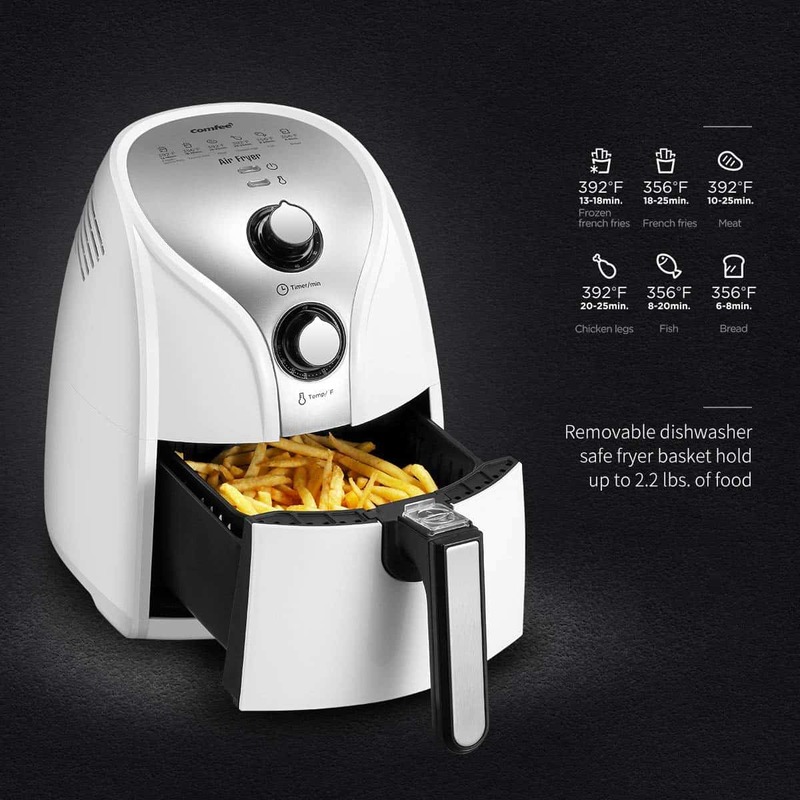 Moreover, it also features AirCrisp technology that allows you to easily and quickly make fried foods without the need of keeping a barrel of oil on your kitchen countertop. It can reduce added fat up to 80% without compromising its flavor. It comes with two manual dials that will allow you to control the time and temperature. You can adjust its temperature up to 400-degree Fahrenheit. This cooker also has a safety feature, a 30-minute timer that will shut off the fryer when it is done. Clean up is also quite easy since its cooking basket is dishwasher safe. You just have to simply let the basket cool off and just toss it right into the dishwasher top rack. It is very easy to use, it operates very similar to a convection oven. It will generate heat almost immediately, you will not need to wait for the oven to get up to a certain temperature. It will be a lot faster to prepare fried foods than using your oven. There are also a pair of LEDs that will tell you when the fryer is turned ON and the other one when it is generating heat. So if you want a compact-sized air fryer you can easily store in your kitchen and at the same time gives you equally healthy and delicious fried foods, you will never go wrong with this DASH Compact Air Fryer. Plus, you can choose among its five different color options: black, grey, red, white and aqua. This small air fryer from COMFEE’ can be a beautiful addition to your small kitchen. It has a multi-function instruction panel with visible instructions for making bread, fish, chicken, meat and french fries. I was pretty impressed by how easy it is to operate the temperature and time dials too. You just have to turn the dials to choose your desired temperature and time. There is also an indicator light and bell that will show you the status of the air fryer. Moreover, this appliance has a large capacity that can hold up to 2.2 lbs. of food; so this is perfect for large families. 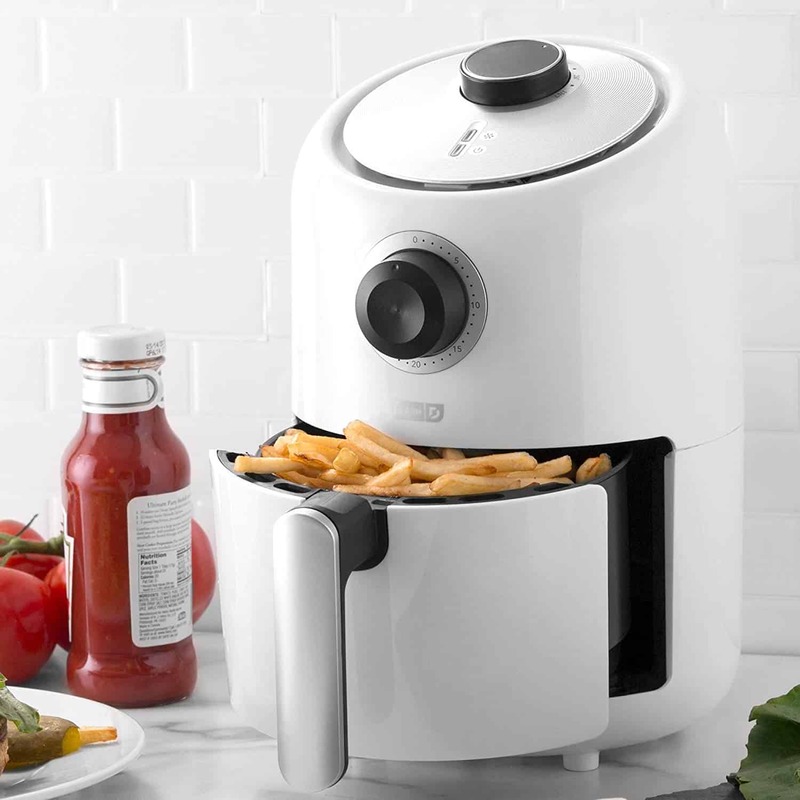 Plus, you will get to serve your family with healthy food since this fryer cooks with 80% less fat. You will be able to cook with no to very little oil and the taste and texture will be exactly the same as deep fried. And this is not just for frying either, you can also grill, roast and bake different ingredients. It features 3D Airflow System that provides accurate circulation, hot air, and the finest temperature balance to make sure everything will be cooked evenly and quickly. Since it uses stainless steel elements, it will be very fast to heat up and evenly fry, grill, and roast. You can even bake cakes, desserts or pies just like you would in an oven, but only quicker. The pan and basket are also detachable and dishwasher safe, making it very easy to clean after every fry. It comes with an anti-slip base to make sure the appliance will stay put when you are cooking. So if space is at a premium in your kitchen, the overall small size of This Little Modern Air Fryer will be a sure bonus. As a compact air fryer, it can tuck into a handy place on your kitchen counter. It comes in a small egg shape design that is neat, compact and a real space saver. But what I like most about this product is how its controls have uniquely combined the best of both manual and digital devices. It comes with an LCD display screen that clearly shows the cook time and temperature. You can manually control these settings with the plus and minus buttons instead of the usual control knob. This combination makes sure you will be able to cook accurately. You can set the time from one to 30 minutes while the temperature is in the range of 170 to 400-degree Fahrenheit. I also like the audible timer sound that lets you know whenever your food is ready. It will beep five times and once the timer goes off, it will take about 20 seconds before the air fryer fan stops. This also uses Rapid Air Circulation (RAC) in cooking your food. The hot air will circulate inside the fryer so your food will be evenly cooked from the inside. It comes with eight settings that include cake, pork, fish, shrimp, steak, chicken, fries and warm. It has a detachable cooking basket and is equipped with a button to avoid unintentional detachment. The air fryer’s basket is detachable, has a non-stick coating and is also dishwasher safe, so cleaning and maintenance will be very easy. 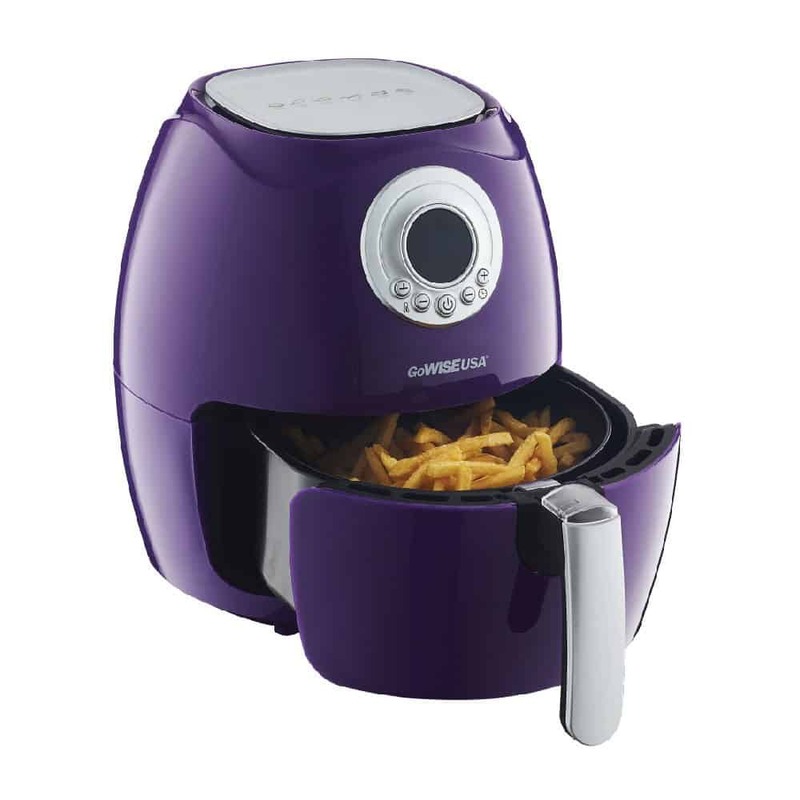 And oh, did I mention that This Little Air Fryer is available in eight different colors? You can definitely find one that suits your style and personality. The available colors are Black, Blush, Chili Red, Majestic Yellow, Mint, Plum, Teal, and White. You will not face any challenges when placing this air fryer in your kitchen counter and it comes in an elegant black color and design that will fit in well with your other kitchen appliances. Moreover, this electric air fryer is great value for money as it provides consistent performance. The air fryer features an advanced cooking element that helps you create crispy munches and will evenly fry your desired food. You can also replace several appliances used for roasting, grilling, baking and so much more with this one versatile machine. The air fryer can also roast and grill with little to no oil at all. In fact, it can even bake. Pretty impressive, isn’t it? Most of all, it has a big capacity that is enough to feed up to a family of four. The basket also uses non-stick metal so you can achieve that crispy, fried taste your family will totally enjoy without the big mess. It features a ‘stay cool handle’ that will protect you from heat. This feature will help you easily and safely remove your meals from the fryer. It is very easy to clean since the basket is detachable and is dishwasher safe. I like how its mechanical knobs are very easy to use. This will allow you to adjust the temperature (from 1 to 400-degree Fahrenheit) and time (from 1 to 30 minutes) for the perfect cooking setting. With just a simple turn of the knob, you will get full control in preparing your favorite snack. Overall, This Air Fryer is a good addition to your kitchen. It has a big capacity to make food for the entire family but won’t take up too much space on your kitchen countertop. With so many great air fryers available, it can be difficult to choose the right one for your needs. Have a look at these tips on what to lookout for when finding the best small air fryers. For your small house and limited counter space, the dimension of the air fryer should be the first thing you need to consider. Of course, you don’t want a countertop appliance that will invade every last inch of the space you’ve got. Some of the larger air fryers available in the market can take up to 15 inches or even more and that’s so much space. A compact one will normally take up no more than 12 inches. You should also be able to stow it away whenever you are not using it. Another thing you need to consider is the capacity of the air fryer. 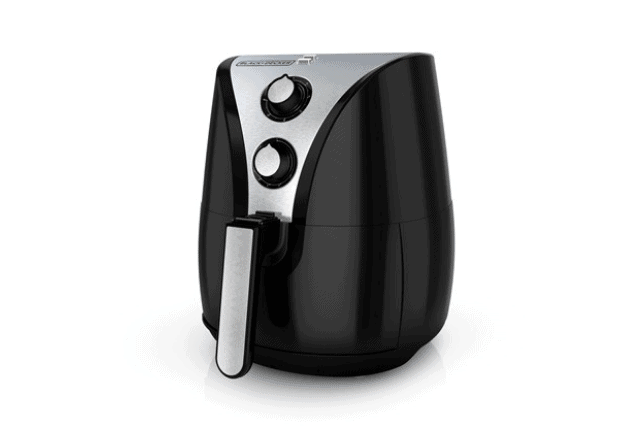 Air fryer models are often measured by its capacity in quart rather than liter. On average, a three and two-quart capacity would be enough for single individuals or two member families. However, for a four to five-member family, it is recommended to opt for an air fryer with more than three-quart capacity. 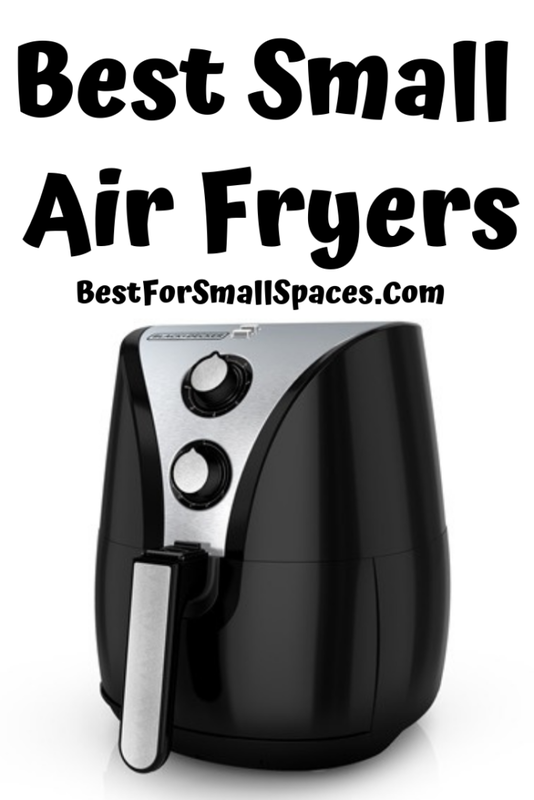 A good air fryer must also be easy to use and easy to clean. Even with all its best features, if you can’t easily use it and clean it, it will undoubtedly overshadow any good the air fryer may intend to do and this will also keep you from using it as frequently as you might like. All of its removable parts should be dishwasher safe, the coating on the interiors should allow easy removal of grease and the physical unit can be wiped down. The controls should also be easy to understand, whether it is manual or digital. There are some air fryers that come with programmable settings and preset options, which is good. This will allow you to easily cook various foods on the go. How much the temperature of the air fryer can reach will also tell you what kinds of food you can cook and for how long you will have to wait for them. For instance, an air fryer with a maximum temperature of 350-degree Fahrenheit will allow you to crisp up fries just fine but if you want to roast your vegetable into a sweet, caramelized state, you might want to look for something that can get a bit hotter. If you have limited space, it doesn’t mean you can no longer enjoy a healthier way of cooking food with a fuss-free air fryer. Ah, there’s nothing compared to the smell of crispy, fried food coursing through the home. If you would like to read reviews on other compact appliances like compact vacuum cleaners or compact dishwashers, then follow the links. Anyway, I hope you found this list of the Best Small Air Fryers 2019 useful and I hope this will help you start making healthier decisions. Let the versatility of these machines help you in creating tasty, healthy meals within minutes.